Wraith Corp. published two megaWADs back in '96, the same year as Final Doom (among other things). Interestingly enough, both works were intertwined with Evilution. Tom Mustaine, Jimmy Sieben, L.A. Sieben, and Jim Elson were all part of Team TNT. I don't know the exact sequence of events, but according to Tom Mustaine, he and his dad Bob started Perdition's Gate during the same period of time the Casalis were developing The Plutonia Experiment. Their intent was to sell it to id as a third megaWAD, making Final Doom a trilogy of sorts. They weren't as fast (or as prompt) as Dario and Milo, though, so when Shawn Green told them their time had run out, they brought Perdition's Gate over to Wraith Corp.
Obituary is The Innocent Crew's third and final single-player PWAD bearing their name before they would go on to helm some of the most recognized community megaWADs to this day. It's Doom II, and 17 levels (MAP01-16 plus MAP31, though there are some deathmatch-only extras). Released in 1995, it's also one of the earliest original megaWADs, certainly of those of any appreciable quality. Thomas and Denis Möller declined to add any semblance of story to this map pack; it's basically random levels for Doom II, with an added emphasis on co-op play. It would be great to fight that badass cobra-goat-demon thing on the titlepic, but, spoiler: you don't. If you have questions, comments, criticisms, suggestions, whatever, feel free to leave them here. I'd prefer comments specific to WADs I've reviewed go to those pages. I do get notifications of those. Granted, I feel kind of dumb responding to stuff like "nice review!" since all I can really say is thanks. Above all, thanks for reading! Oh, and please don't leave comments here or anywhere else asking for immediate help (specifically with completing PWADS). I probably don't remember what you're asking about off-hand and by the time I figure it out you'll probably have it answered on your own. Hell to Pay is the other half of WizardWorks' WAD combo, crafted by Jimmy "EvilGenius" Sieben (who was also a major contributor on TeamTNT), Mackey "Avatar" McCandlish, and Jim Elson. 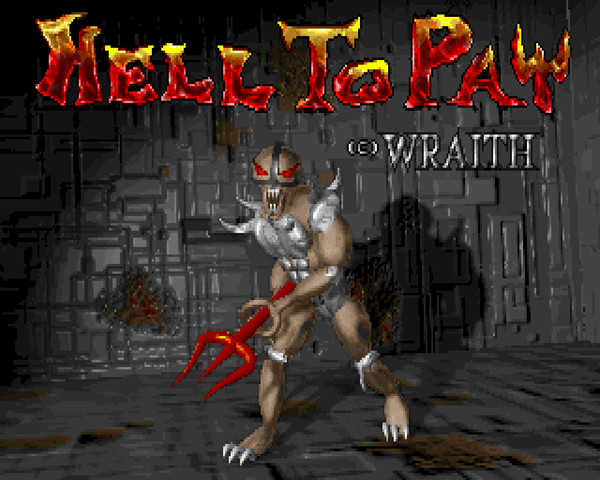 It's a full replacement for Doom II, replacing all 32 maps, and a partial conversion, replacing the sprites of several weapons and more than a few enemies, using primitive 3D renders for the imp, demon / spectre, cacodemon, mancubus, pain elemental and lost soul. They also have a host of new sounds to go along with the mechanical enemies resulting in some gaffes; the mechanized sounds replace some of the generic demon noises which are shared by the upper-class demons. 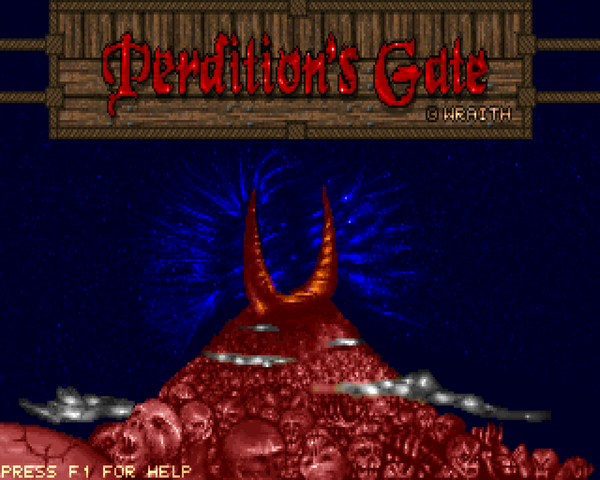 Perdition's Gate was one of a suite of Doom commercial WADs published by WizardWorks. The project started out between Tom Mustaine and his father, Bob, as a third megaWAD for inclusion with Final Doom, but at some point "the Final Doom window of opportunity had closed", so they took the project over to Wraith Corporation. Composed of some prominent members of the community (notably Jim Elson, Jimmy "EvilGenius" Sieben and Mackey "Avatar" McCandlish), they were producing a megaWAD that wasn't being released by id, Hell to Pay. Wraith Corp. helped finish out the rest of the megaWAD, giving the community another pair of commercial products, roughly analogous to Final Doom. 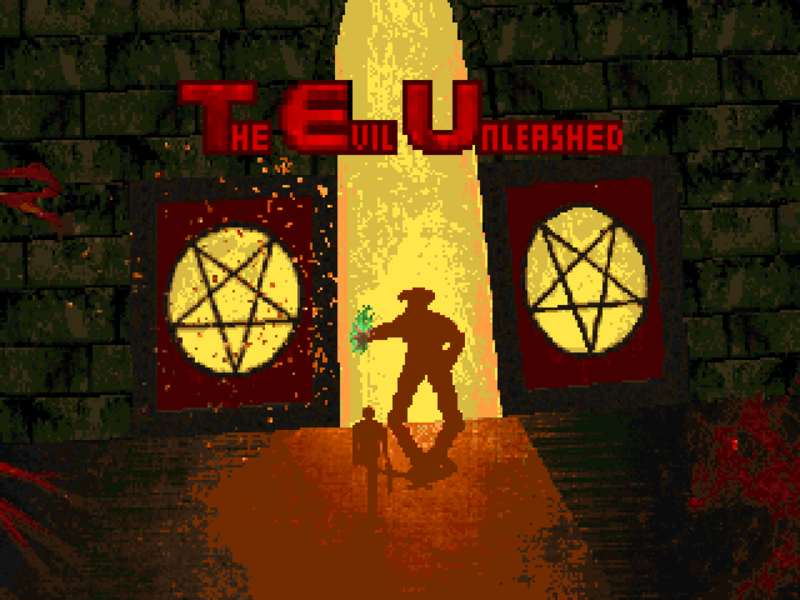 Hot on the heels of their first episode WAD for Doom, the Teutonic TiC - Thomas and Denis Möller - released The Evil Unleashed as their sophomore WAD building effort, this time replacing Episode 3. It follows most of the same design principles behind Slaughter Until Death, but with tighter gameplay and slightly harder difficulty and even better architecture and design. As with SUDTIC, the aesthetic theme is an abstract union between all of Doom's textures with no real attempt at an overarching plot, but that's fine, because while a plot can enhance the feel of Doom, the real meat is in the gameplay, and TEUTIC delivers. Perhaps no team of Doomers is better known in the early days of Doom than The Innocent Crew. Thomas and Dennis Moeller (aka Panza and Grindcrusher / Vorthalak respectively) raised the bar on PWAD level quality from near the beginning and continued to do so until they left to map for id's next big release, Quake. 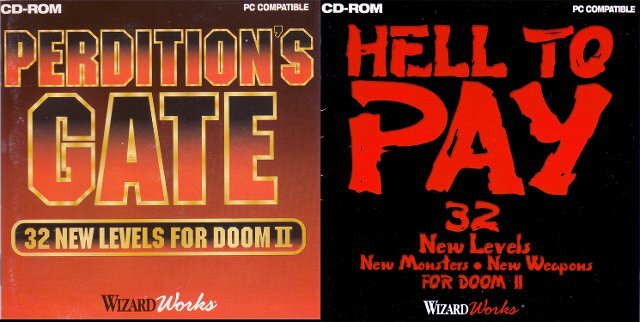 In their wake, they left two Doom episode replacements, a partial conversion (and megawad) for Doom II, and three community megawads, also for Doom II. They never really bothered with stories; they just liked making maps for the Hell of it. Doom: The Lost Episode is an unofficial fifth episode (complete with intermission screen!) released for Ultimate Doom in 2009, requiring either ZDoom or Eternity to run. Headed by Xaser with additional credit to Skunk, Wills, Nuxius and SnowKate709, it aimed to collect unused Doom Alpha maps with maps exclusive to the various console versions of Doom and retool them to create a strange but excellent adventure (link to development thread here). For those interested the in narrative justifications Doom authors provide for their unholy concoctions, the story is quite simple. 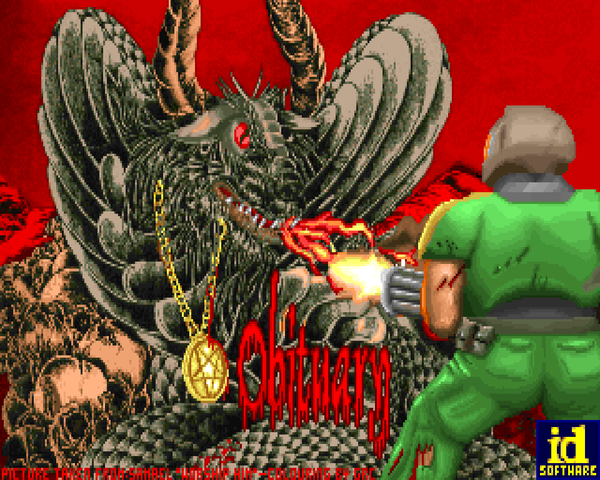 Crammed right in between Doomguy avenging the death of his pet rabbit and his arduous campaign to rid Earth itself of Hellspawn, the action finds our protagonist teleported into a fragmented dimension as a last-ditch attempt to distance Doomguy from the campaign of Evil. You'll have to fight your way through to the architects of the false reality to return to your own. 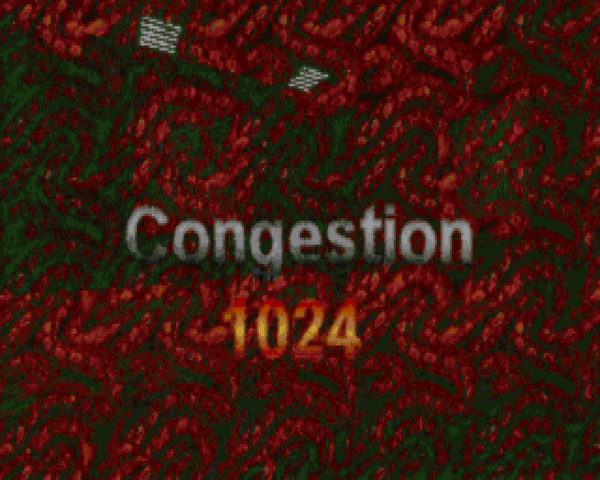 Congestion 1024 is a Doom II megaWAD released in 2005, born from the Exquisite Corpse project, in which a collection of mappers created twelve 1024 x 1024 maps and bound them together as a single, contiguous level. I assume either those involved or those observing found the individual puzzle pieces so intriguing that they made an entire WAD out of similarly sized bits, creating 32 levels of intense action. The rules: the player is bound to a 1024 x 1024 area. They are allowed egress as long as they die upon leaving the 1024 confinement. Monsters, of course, are allowed to be outside the area's bounds and frequently are. Suspended in Dusk is a minisode for Doom II and a 2005 Cacoward winner, replacing MAP01-04. Perhaps deceased Doomer Espi's most famous output, SiD is big, beautiful, and completely vanilla. The WAD has no written story to accompany it. Rather, it establishes a narrative through architecture, thing placement, and texture themes. SiD takes place in an isolated techbase located in a mountain range gloaming with Hellspawn. The player must fight through the compound, deep into the very bowels of the base, locating one of the few remaining escape shuttles in order to leave upon completing his or her objective. 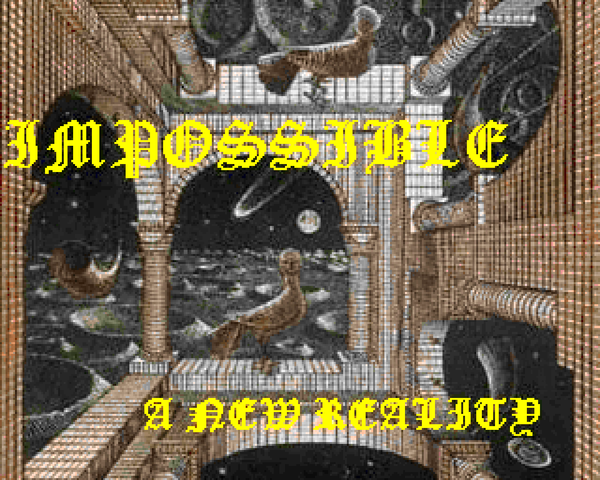 Impossible: A New Reality is a single level for ZDoom and it's a big one with hub-like qualities and trickery - especially trickery. There are some ZDoom features used quite cleverly like mirror effects but by far the most extensive element to be utilized here is the silent teleporter, creating M.C. Escher Doom. It's also virtually all brand-new textures, adding to the otherworldly feel by placing the map firmly in some pseudo-fantasy location. I'm not sure where most of the non-Doom stuff comes from but I know that a few belong to Hexen II. They really help the map shine. Heroes... 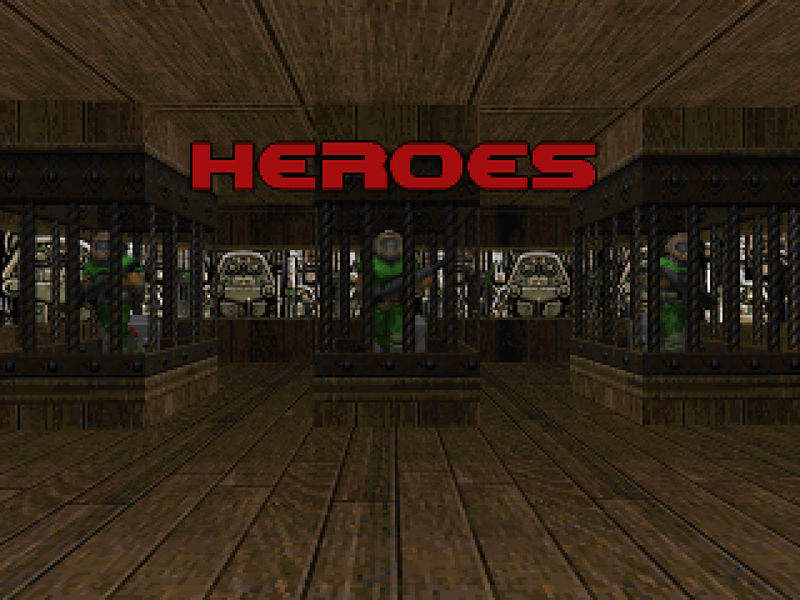 Heroes is one of the earliest Ultimate Doom megaWADs, but it isn't an entirely original endeavor. The archiver, Al Dewey, curated most of these levels as the cream of his crop and took care modifying and expanding them. Judging from rough comparisons and the end product I believe that most if not all alterations were for the better. I'm not knocking the originals, though; Dewey wasn't in the business of slapping together a bunch of stuff as was popular back in the day when people just wanted to play entire episodes of Doom. WADPAK, EPIBEST, the list goes on and on. Heroes has the distinction of being somewhat canonized, a lot of which I'm sure has to do with Dewey's consideration when putting this whole thing together. Of all the compilations I've seen his has certainly been the most lauded. and the Flesh Wizard, which along with the Grosses is currently available for download and testing, and appears to be Arch-Vile inspired (graphically, at least) and warps around, shooting fireballs. Not even counting the host of graphical effects and new weapons. I wish Mr. Ramirez the best of luck and look forward to future updates; any quality project for ZDoom is a project well worth waiting for. 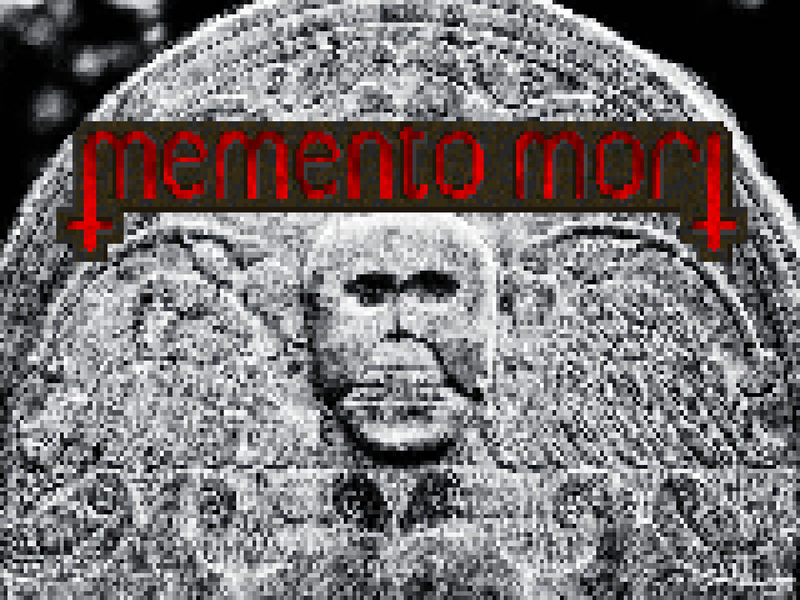 This is just a little blog I cooked up as a while ago I decided to start taking "notes" about the Doom WADs I play in my spare time, but there wasn't really any proper format to share them, since a personal website isn't strictly necessary and they really end up feeling more like journal entries than say reviews or whatnot. I've got a considerable backlog that I'll post through, but a few quick mentions. I usually play Doom in ZDoom if I can (purely out of convenience). Not hating on other engines; I grew up in DOS Doom and did my adolescent Dooming in Doom 95. In the future I'll probably use stuff like PrBoom and Chocolate more, but for now, it's ZDoom. I use freelook, 'cause not being able to look up and down bothers the hell out of me, but I (contrarily) keep my view in the center of the screen unless I'm admiring the level's architecture. Wierd, I know. Otherwise, I play from pistol start (if possible) and with no saves, and on Ultra-Violence (if possible). It hasn't been easy at times, but it's been a welcome challenge. Pistol starts turn the maps from slaughterfests into distinct puzzles with their own order and particular solutions. I won't be starting with all the official stuff, but I'll be replaying it later, 'cause I sure as hell didn't do them with no saves or purely pistol start. I replayed E1 recently and was surprised by how much harder it was when you don't start out with a full kit of weapons and ammo every map, and that's coming off of Double Impact, a fantastic E1 WAD I just finished that ran me up and down the court. Well, I don't expect many (if any) people to find this, but if you happen to wander on by, thanks for reading!